Ad4game | AdsWiki - Ad Network Listing, Reviews, Payment Proof & Advertising News. 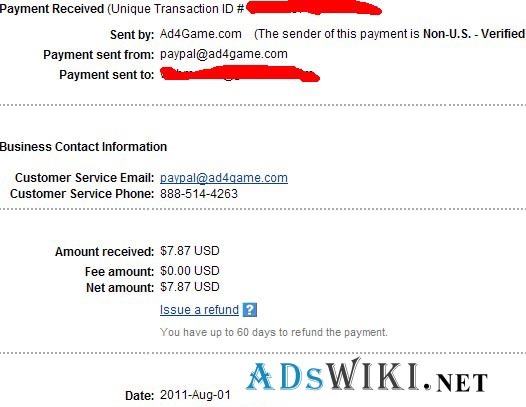 Ad4Game is the Internet’s Game Ad Network. We are partnered with the key players in the gaming industry. The company is focused on gamers ONLY. We want to make sure our advertisers can reach a highly targeted gaming audience. Ads we place on our publishers’ websites are relevant and interesting to their visitors.The company offers a high level of service, statistics, control and transparency to help our customers succeed. Ad4Game is a simple and effective ad network suitable for advertisers and publishers of all sizes.Ad4Game is headquartered in Montreal, QC, Canada. We have been involved in Games online marketing since 2004. Oriented to publishers with gaming content, and also offers Flash in-game ads. Allows redirection of default impressions. We have used this network, and have received payments. good ecpm rates for all countries..